Northwards again, time had caught up with me, well sort of. It would take a few days to return north and I did not want to stress. Coming back to the hotel after another eventful riding day had a quick shower, then went down for a pint and some food. Waiting for the restaurant to open I hang out in the lobby, where I met two fellow riders. We started to talk. Very nice guys, didn’t take long before we’d tuned in to common wavelengths. Dejan had come all the way from Australia to spend time with friends & family home in Serbia. 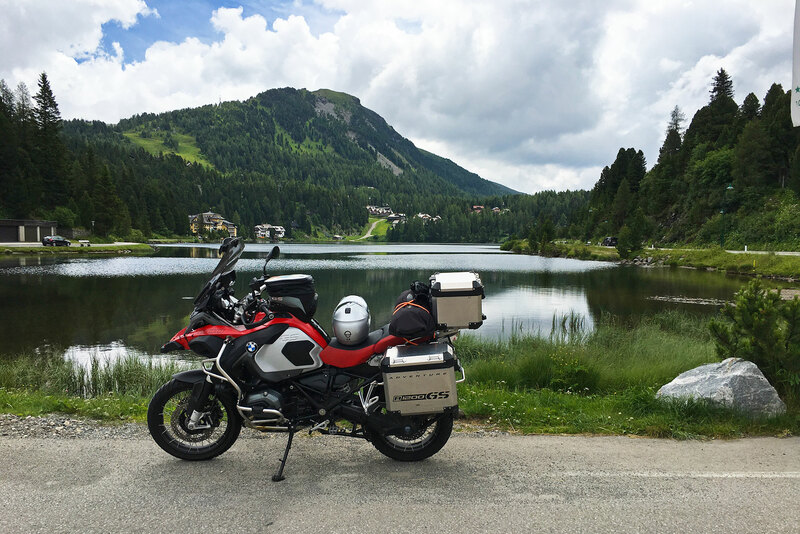 Together with friend Nebosja getting a good taste of Alpine two-wheel experiences. Nebosja would later return back to Serbia, while Dejan continued west, then north towards Scandinavia & Norway with another friend. Their plan was to ride all the way up to the North Cape. Turned out to be an impressive, eventful ride. I believe he clocked 14.500 kilometers altogether. Hopefully that story will be told in full length on day. Morning of the 4th of July I woke up to partially blue sky, with low drifting clouds along the mountain sides. Prospects of a nice, dry riding day seemed good! 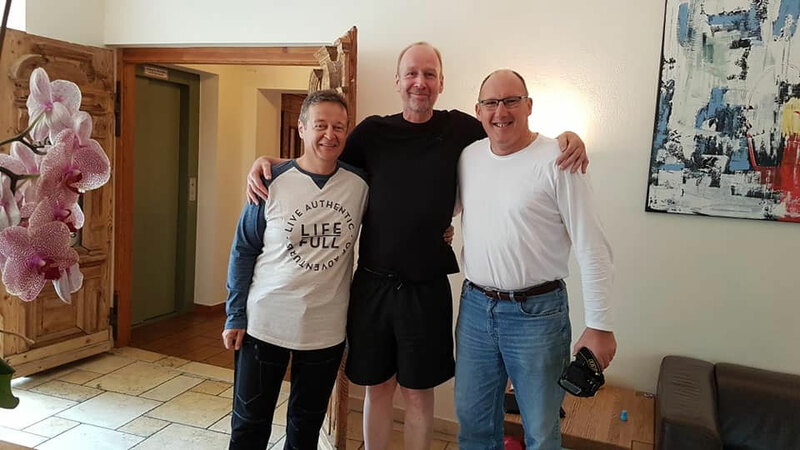 After breakfast I said farewell to my friends, headed northwards on road 110, the same way I came down to Kötschach Mauthen two days before. In Oberdrauburg I followed road 100 east. These roads aren’t overly exciting, but it would get better. 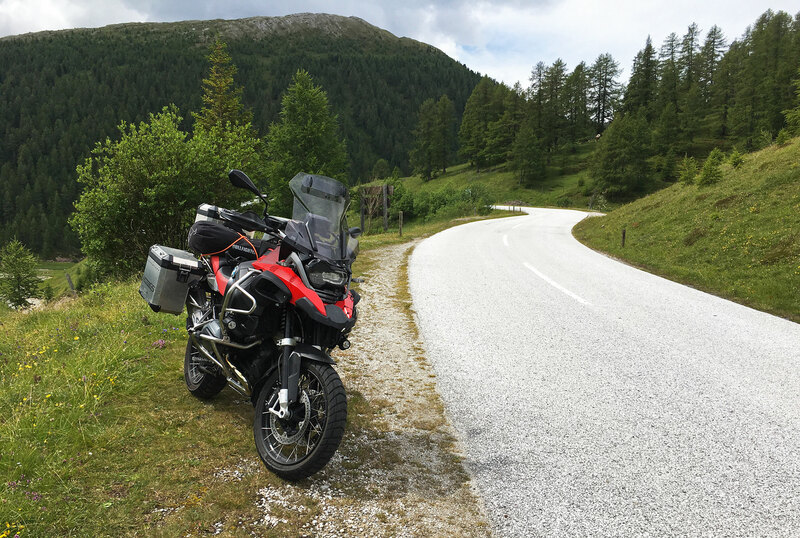 The plan of the day was to ride NockalmStrasse (Nockalm road), in getting there take time and explore. Near Seeboden I took off from the larger road and began to crisscross valleys on narrow small ways along the A10. Along the A10 there are several nice smallways across farmlands. Around Kremsbrucke I took the road to Vorderkrems which will take you to Innerkrems. That’s where the NockalmStrasse begins. 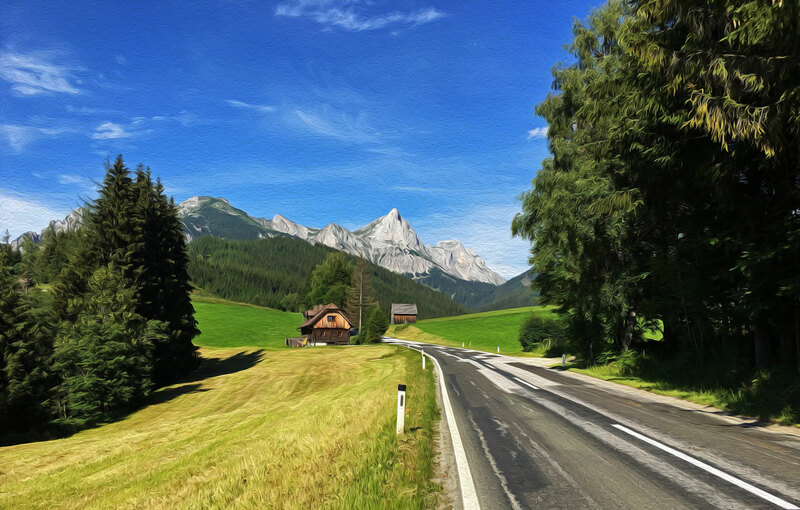 If you’ve ridden or driven in southern Tirol, like in the Dolomites, you might not find Nock Mountains very impressive. It’s a different kind of topography. The Nock Mountains are the westernmost and highest mountain range of the Gurktal Alps in Austria. 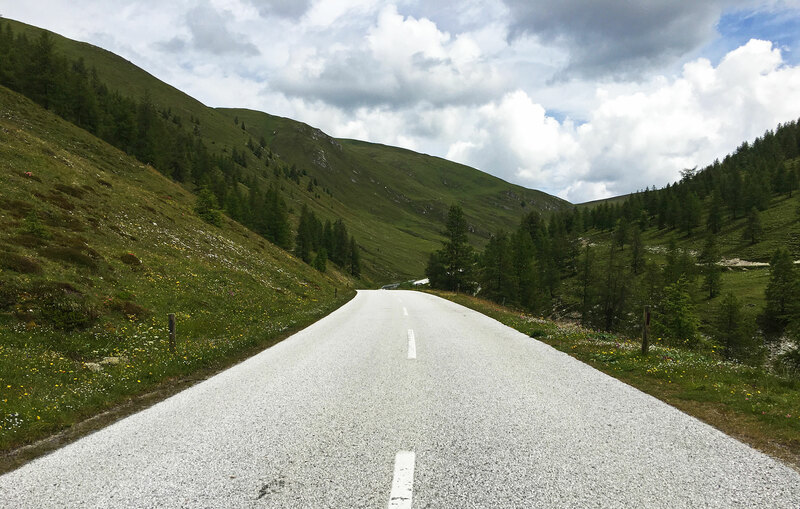 The NockalmStrasse is by no means a boring road, quite the contrary. 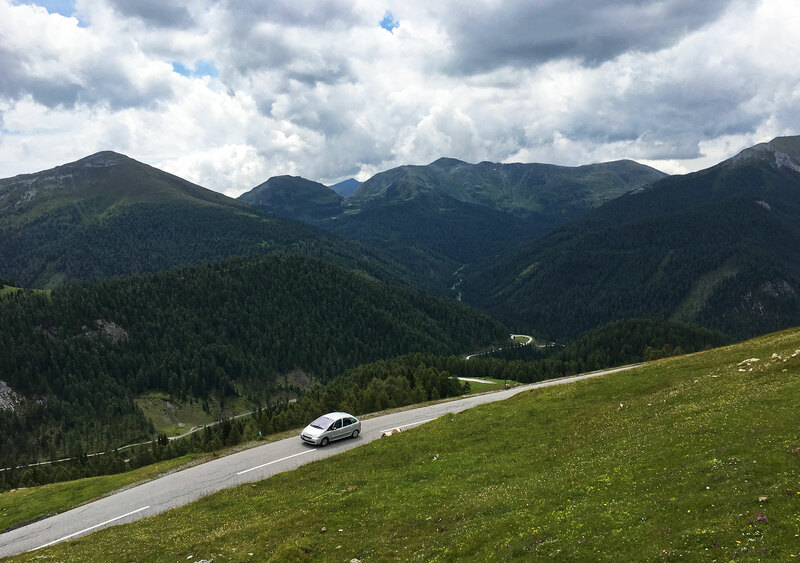 Featuring 52 hairpins, great tarmac and scenery it’s perhaps less demanding than Alpine roads in Southern Tirol but that doesn’t diminish the experience. On the way up Nockalm Road towards the highest point. Many riders will like the rougher tarmac, makes tires stick very well to the surface, but be wary of surprises, always! Coming up through a curve I spotted something dark’ish in my lane. Turned out to be a fairly large rock! It’s presence was a mystery, since there was nothing in the surrounding landscape that could explain how it go there. Stopped and removed it from the lane, of course, then carried on towards the summit. At the highest point there were lots of buses and tourists. Because of that didn’t stay for long, gulped down a coffee, admired the view for some minutes, and took some pictures. Am not much of a selfie guy but equipped with a rod it makes for more interesting shots. Photo session over, I got back on the road and started the descent. 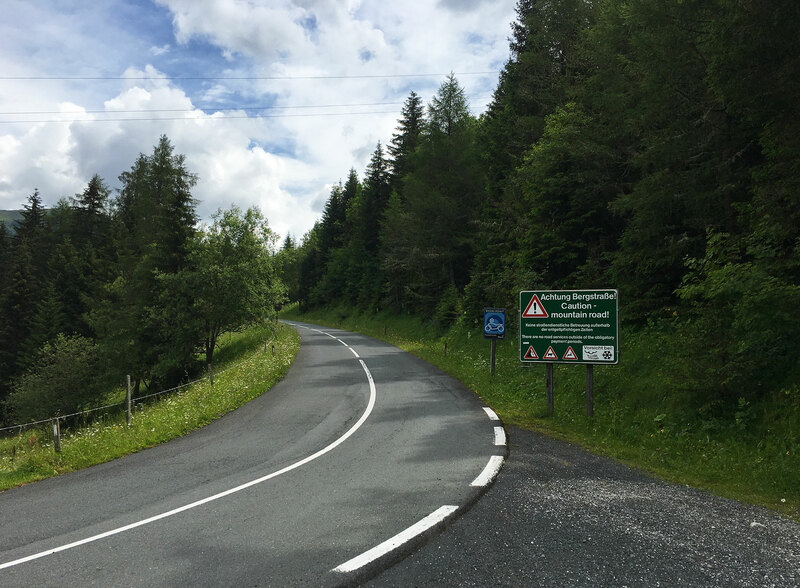 NockalmStrasse is perfect riding for those who like curvy roads, but like to have good overview when doing hairpins. The open landscape makes it easy to see what’s coming up ahead, for the most part. Nock mountains and Gurktal Alps are quite different from the western Alps. 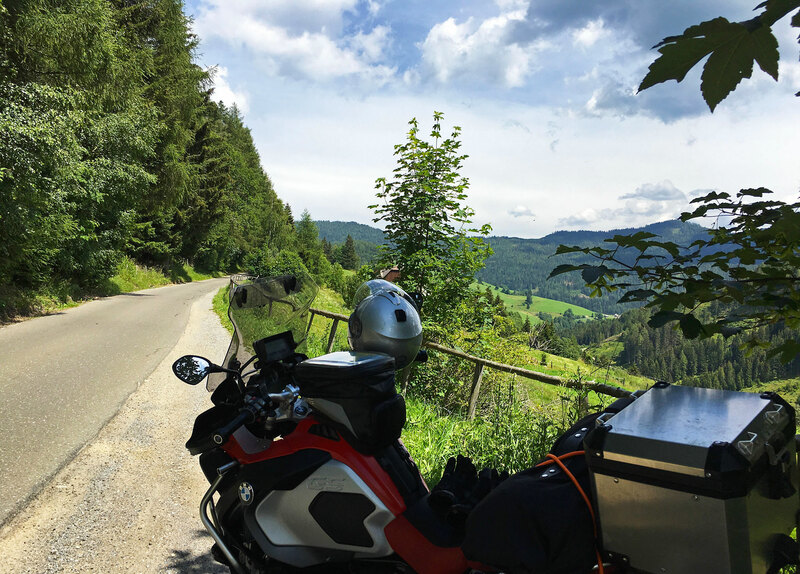 Had a great ride down Nockalm road to Reichenau. One day in the future I’ll do the other direction for, as we bikers say, a road isn’t properly ridden until you’ve done it in both directions! Continued past Reichenau south, changed my mind and turned around. I was supposed to go northwards! Shortly after it dawned on me I’d been here before. Yep, the GPS confirmed, road 95 or Turracher Strasse was the road I came the opposite way in 2017. 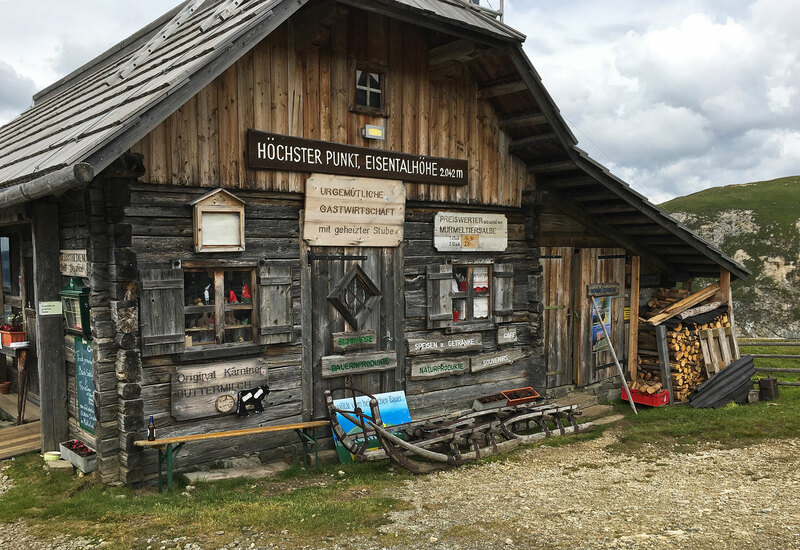 A little climb later up the road and I was at the Turracher Höhe Pass. Stopped briefly lakeside, not far from Hotel Kornock where I had a pleasant stay last year. Then continued northwards on road 95 to Predlitz, then east on road 97. Along the road I became aware of a route with promise. A narrow, twisty, winded road across the mountains. Sadly it turned out to be closed, so had to take another route, one that led me through a couple of narrow side-valleys and across farms. Stopped in the small town of Schöder for a lunch. 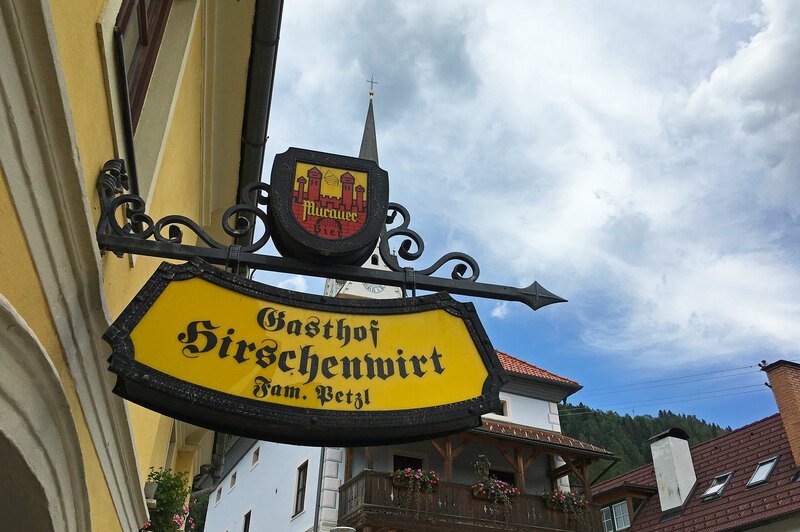 Incidentally I’d chosen a small town with a GastHof that had been serving guests since 1423! Or, to put it into perspective, since 70 years before Columbus “discovered” America. There I learned the route I’d wanted to do had been closed late 2017 due to flood damages. Plus got a good lunch recommendation of local produce, marvelous food! Filled up I continued northwards, weather was great and neither road nor landscape let me down. I was now on a slightly eastern course. The town name Judenburg showed up on the GPS. it’s a historic city so decided to ride into town just to have been there. Lots of interesting buildings but it was hot and I had no desire to stop and go explore. Something for a later pass-through. Now it was back on a northwards course, along the 114 to Trieben. 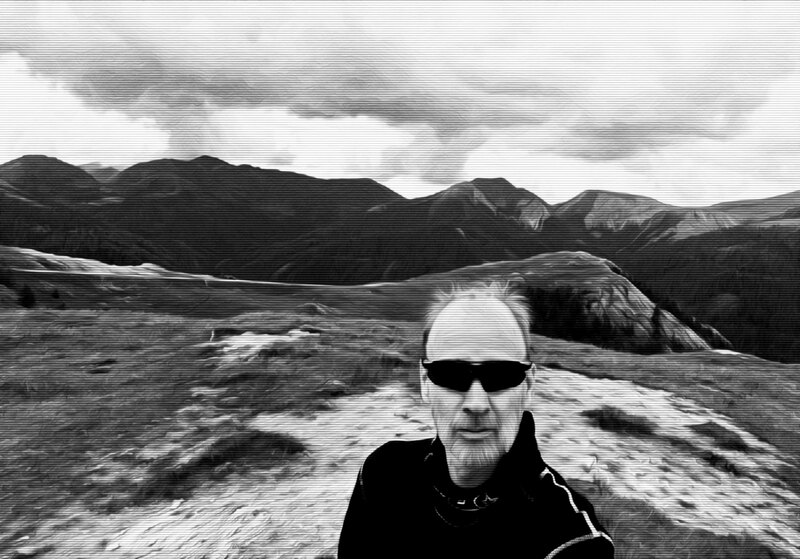 Back on a smaller road towards Admont. 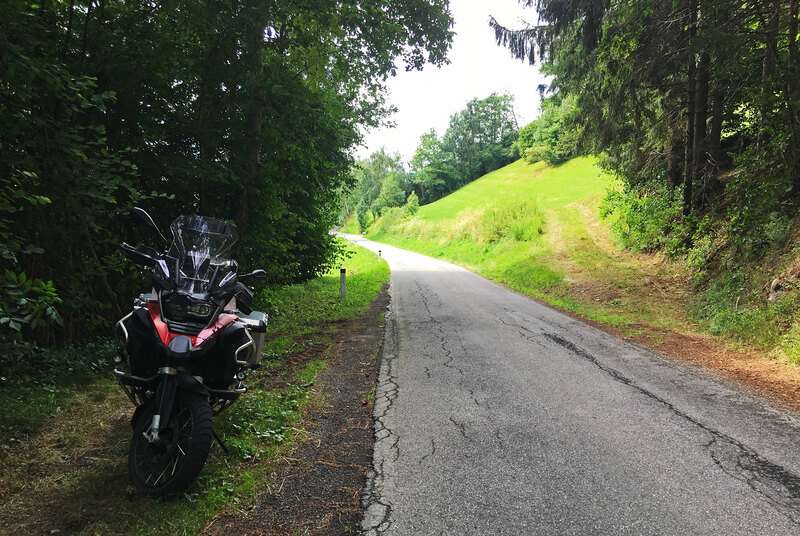 I never get tired of riding these smaller roads in Austria, around every corner there’s something new to behold. Gesäuse National Park up ahead! I took the L713, up and around a corner the above unfolded. 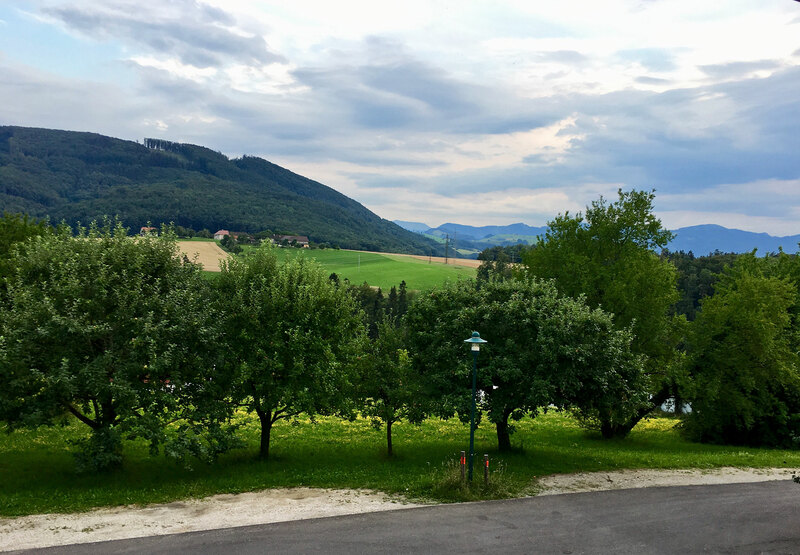 Breathtaking nature and the first glimpse of the Gesäuse National Park with its imposing mountains. At Admont I followed the Gesäuse road through the the park. it was getting later in the afternoon, but I stayed on for a little longer. The plan was to get closer to the border of the Czech Republic. 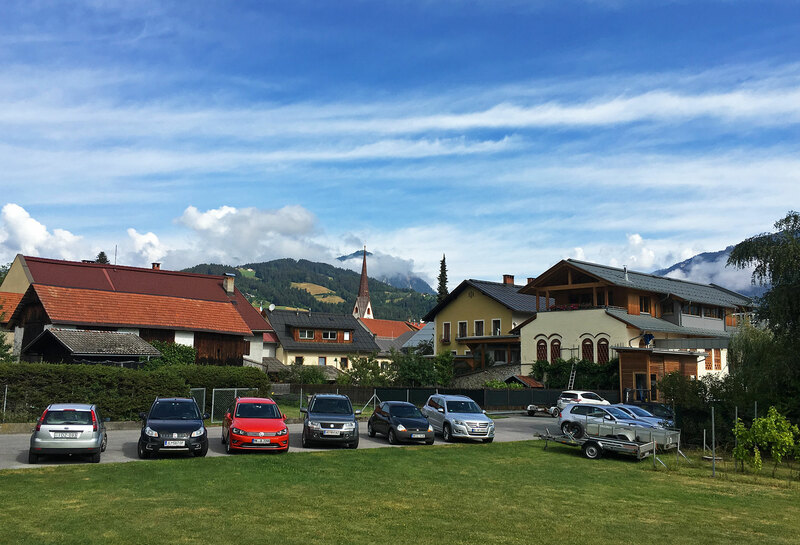 A little before Steyr, which is a little south of Linz, more specifically in Sankt Ulrich bei Steyr, I took off the road and to Landgasthof Mayr. Booked a room as I was approaching, the establishment seemed ok, and had gotten good reviews. It was alright, I thought overpriced, won’t be going back. Two Schnitzels, some veggies, fries and beers later it was time to call it a day and retire to bed. The next day I would be in Czech Republic! Below a snapshot of the route of the day. Click to expand. 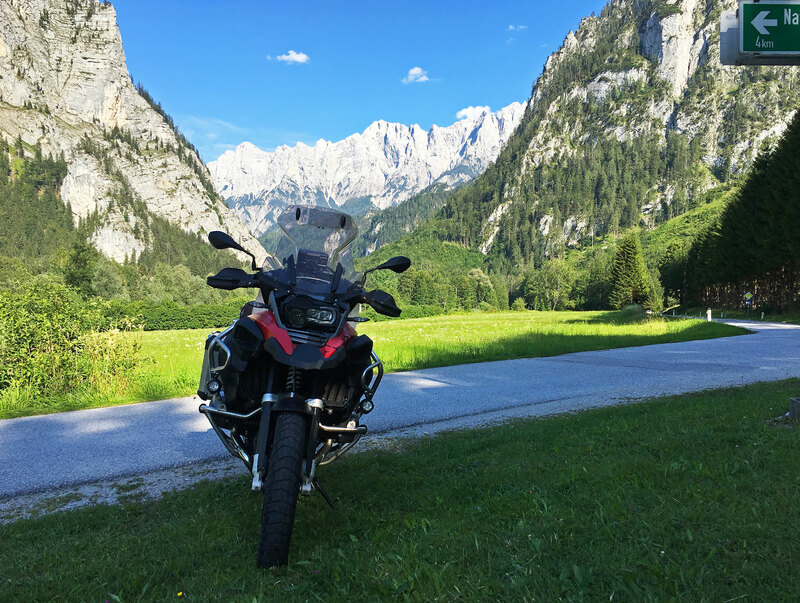 This entry was posted in MC rides, trips & adventures and tagged Adventure, Austria, MC riding, Nature, Vacation. Bookmark the permalink. An epic adventure fitting of a modern day motorcycle Viking. Without the looting and pillaging along the way.